Eileen Gaeth, 93, of Lee's Summit, Missouri, died Saturday, April 22, 2017, at St. Luke's East Hospital in Lee's Summit. 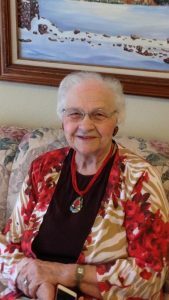 Memorial Service Saturday, May 27, 2017 Kracl Funeral Chapel 11:00 A.M.
Doris Eileen Gaeth, 93, passed away peacefully in Lee’s Summit, Missouri on Saturday April 22, 2017. She was born May 31, 1923 to Cephas and Hattie Peters in Rodgers, Nebraska. She married Ernest K. Gaeth Sr. on September 2, 1942 and they moved to a farm northeast of Schuyler, NE to raise their family. They farmed, until their retirement, and then moved into town. In 2001, Eileen left her life in Schuyler and moved to Columbia, Missouri and later to Lees Summit to be near her family. She was preceded in death by her husband, her three children (Ernest Jr, Jack, and Linda), and all her siblings. Despite family hardship and heartaches, Eileen always showed such grace and a beautiful smile. She was a role model and mentored family and friends on a way to live life to the fullest, never complaining and always filled with compassion. She loved writing letters, sending cards, and even texting as a way to stay connected with friends and family. She enjoyed playing cards and games and supported those that aspired to beat her, as she routinely won. Anyone who knew Eileen felt her love and kind spirit, along with her sharp wit and sense of humor. She is survived by her daughter in law, Marilyn Miller Gaeth of Rancho Mirage, CA; three grandsons, Jeff (Angie) Gaeth of Kansas City, MO, Steve (Renee) Gaeth of Midlothian, VA, John(Maria) Gonzalez of Homestead, FL , and wonderful great grandchildren, nieces, and nephews. A memorial service will be held at 11:00am on May 27, 2017 at the Kracl Funera Chapel in Schuyler, followed by a short ceremony at the Schuyler Cemetery. Family and friends are invited to the Cobblestone Inn after the ceremony for a celebration of life.